FILE - Venezuela's President Nicolas Maduro holds a copy of the National Constitution while he speaks during a news conference at Miraflores Palace in Caracas, Venezuela, Jan. 9, 2019. Venezuelan President Nicolas Maduro is breaking off diplomatic relations with the United States and is giving embassy personnel 72 hours to get out of the country. But the top U.S. diplomat says Maduro no longer has the authority to do so. Maduro made his announcement Wednesday hours after President Donald Trump officially recognized Juan Guaido as Venezuela's interim leader and issued a blunt warning to Maduro. "We're not considering anything, but all options are on the table" if there is not a peaceful transition to democracy in the South American country, Trump told reporters. Trump's announcement came shortly after Guaido, the opposition politician, declared himself president during a day of mass demonstrations in Venezuela against Maduro. "Today, I am officially recognizing the president of the Venezuelan National Assembly, Juan Guaido, as the Interim president of Venezuela," Trump said in a statement. U.S. Secretary of State Mike Pompeo responded to Maduro's announcement that Venezuela was severing diplomatic ties with the U.S. by saying Maduro no longer has the authority to do so. "The United States does not recognize the Maduro regime as the government of Venezuela," Pompeo said in a statement. "Accordingly, the United States does not consider former President Nicolas Maduro to have the legal authority to break diplomatic relations." White House officials emphasized that Trump is not ruling out any response, such as a naval blockade or other military action, if Maduro unleashes violence against protesters or moves against Guaido. The most immediate action by Washington likely will be enhanced sanctions against members of Maduro's government. The Trump administration also is likely to impose new sanctions on Venezuela's oil sector if the political situation in Caracas deteriorates this week. In addition, Washington is directly applying pressure on Maduro to give up the presidency as he faces mounting global criticism following his reelection last year that was widely considered illegitimate. "We call on Maduro to step aside in favor of a legitimate leader reflecting the will of the Venezuelan people," Pompeo said in a statement. The United States wants other countries to recognize Guaido. Canada and 11 of 14 members of the newly formed Lima Group of Latin nations say they will. Guyana, Saint Lucia and Mexico are the Lima Group holdouts, with Mexico saying it is "analyzing the situation." Canada says it will also recognize Guaido. While the European Union did not make an outright declaration of support for Guaido, European Council President Donald Tusk tweeted, "Unlike Maduro, the parliamentary assembly, including Juan Guaido, have a democratic mandate from Venezuelan citizens." But Bolivia says it will stand in "solidarity with the Venezuelan people and Nicolas Maduro," saying the "claws of imperialism are once again trying to deal a death blow to democracy and self-determination" in South America. Cuban President Miguel Diaz-Canel also expressed support and solidarity in a tweet. "From a constitutional, humanitarian and democratic perspective — and according to international law — there was no option left for the United States and the international community but to recognize Juan Guaido as the interim president of Venezuela." Moises Rendon, associate director and associate fellow of the CSIS Americas Program, told VOA. Trump's recognition of Guaido as Venezuela's president is a "big and courageous move," tweeted Dany Bahar, who is a Venezuelan economist and scholar at the Brookings Institution. The U.S. action, according to Bahar, opens the door for the Venezuelan opposition to have an ambassador recognized by Washington and deal with the country's bondholders. Venezuela and its state-owned oil company, PDVSA, are estimated to owe $7 billion on a combined trade debt of about $60 billion. The country's oil-based economy, which is wracked by hyper-inflation, has collapsed. Police lined streets and bridges in Caracas as opposition protesters threw objects at them and chanted "Get out Maduro" and other slogans. In the middle-class neighborhood of El Paraiso, National Guard troops launched tear gas at protesters, who say they are angry over rising inflation, a shortage of basic goods and a migration crisis that has divided families. Opposition supporters take part in a rally against Venezuelan President Nicolas Maduro's government in Caracas, Venezuela Jan. 23, 2019. 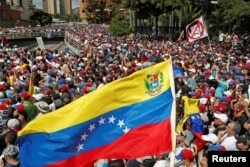 Counter-protests also have been organized by the Venezuelan government, which has accused the opposition of provoking violence. The anti-government protests are a crucial test for Guaido, the newly installed leader of Congress. Guaido and his followers hope to get the poor and the military to shift loyalties to their opposition movement. Any government change, however, depends on the allegiance of the armed forces, which have supported Maduro through two waves of street protests and an ongoing deconstruction of democratic institutions. 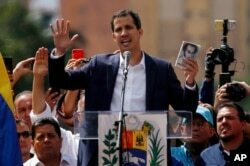 Guaido has called on the military to repudiate Maduro and promised amnesty to those who help work toward restoring democracy.